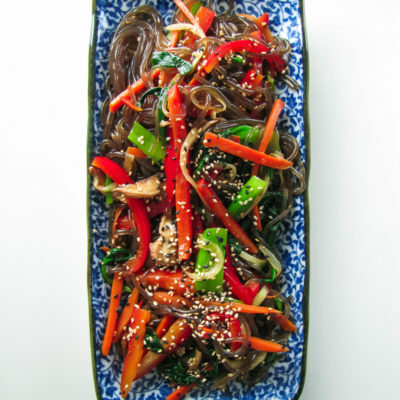 Japchae is a Korean sweet and savoury dish made with sweet potato noodles and stir-fried veggies, traditionally served with Korean marinated beef. This one is a vegan version, incredibly flavourful and delicious because the noodles are made of sweet potatoes this dish is also paleo and gluten-free friendly and is refined sugar-free! 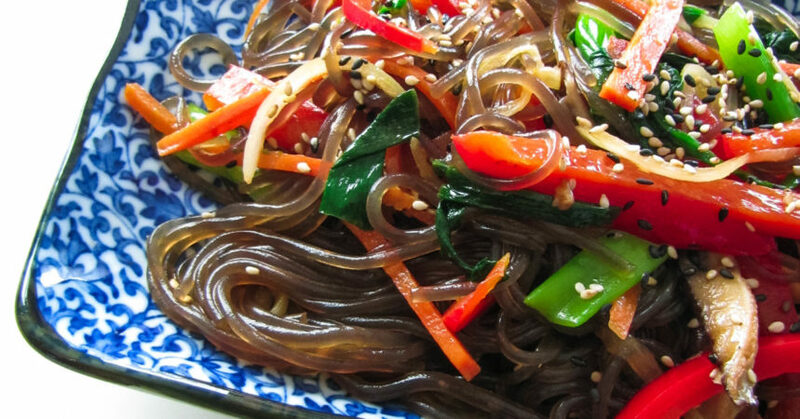 The sweet potato noodles are a variety of glass noodles, called dangmyeon. 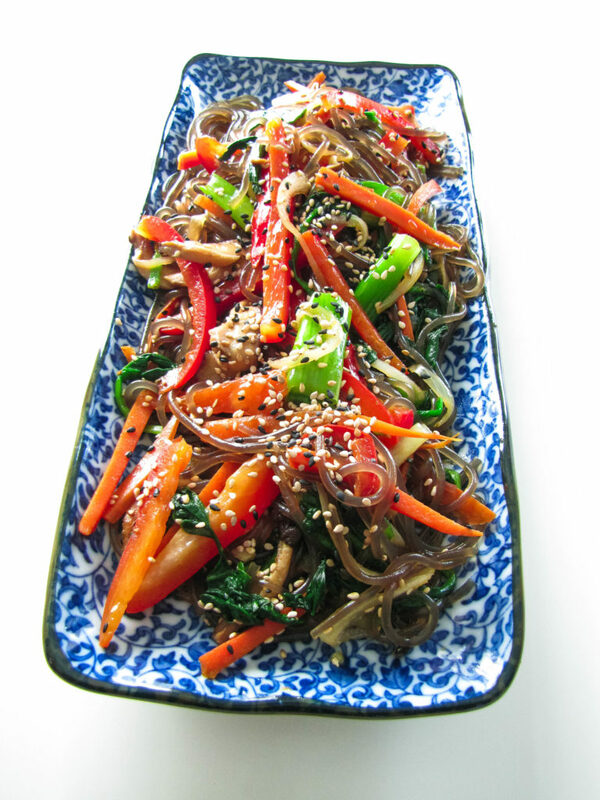 Instead of sweet potato noodles, you can use, acorn starch noodles, tapioca starch noodles or mung bean starch noodles, thus keeping it paleo and gluten-free friendly. They can be easily found in your local Korean grocery store. 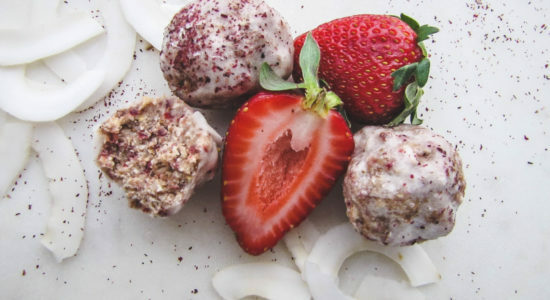 It is very easy to make and incredibly delicious to eat. Although it may take a little bit of time, as the vegetables need to be stir-fried separately, I will guide you through a quick and effective way of making this dish so that you can sit down and enjoy this mal 20-30 minutes from the moment you open the fridge. 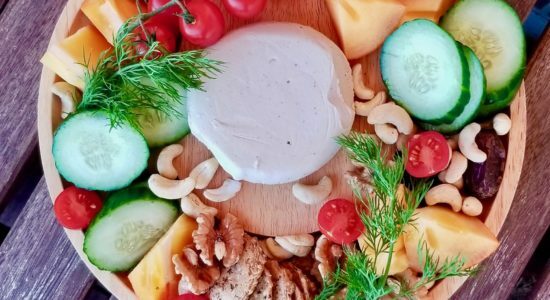 This dish is a perfect party meal, great for potlucks. 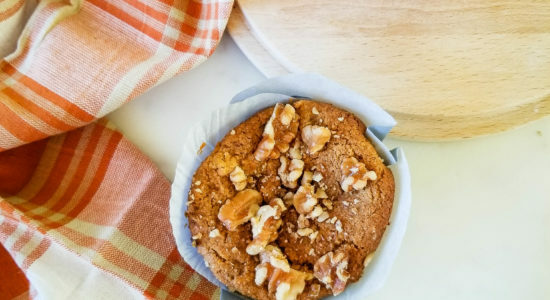 If you try out this recipe let us know! Leave a comment, rate it and tag a photo #holistickenko on Instagram! Have a wonderfully positive day everyone! 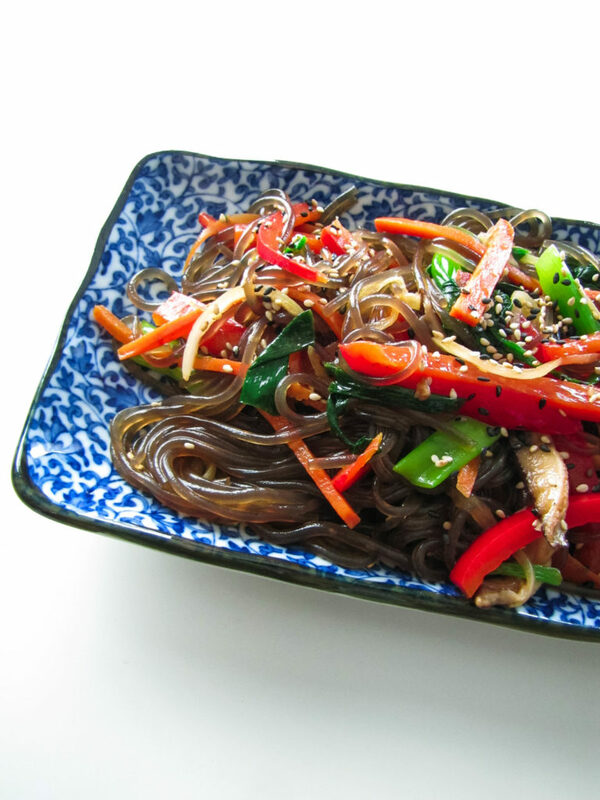 Japchae is a Korean sweet and savoury dish made with sweet potato noodles and stir-fried veggies. Place a large pot of water on your stove. Cover and let the water come to a boil. In the meantime prep your spinach, washing it, discard any leaves that may have wilted, keep the long stems on. Prepare the rest of your vegetables, place them in separate piles and set aside. Once the water has come to a boil add in the spinach leaves. Let them blanch for between 30 seconds to 1 minute no longer. Scoop them out with a small colander scoop or a spider strainer. Do not drain the water, leave it in the pot on the stove, bring the water back to a boil. Rinse the spinach leaves in cold water to stop the cooking process. Squeeze all the water out of them. This will form a little spinach ball, cut the spinach into several pieces and add the cut pieces into a large bowl. 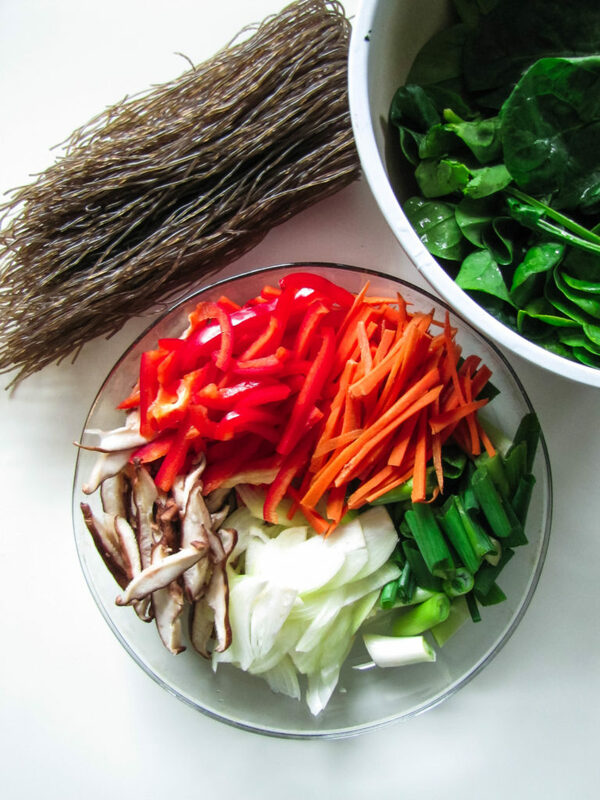 Add 1 tsp of sesame oil and 1 tsp of tamari, use your fingers to incorporate them into the spinach. set aside. With the leftover water in the pot, once it has come to a boil, add a bit of salt, then place the noodles into the pot and cook as directed on the package. As the noodles are cooking, add coconut oil to a cast iron pan and heat up on medium to medium-high. Begin by cooking the mushrooms first, add a little bit of salt. Cook until golden in colour. Transfer the mushrooms to the bowl with the spinach. Adding another tsp of coconut oil add in the onions and green onions, cook until soft. Once soft transfer to the bowl of cooked veggies. If there are larger pieces of green onion that have not cooked through, leave them aside and cook longer with the carrots and red pepper. Add a final tsp of coconut oil to the pan and cook the carrots and bell pepper on the pan, add to this the minced garlic. Make sure to check on the noodles, once ready drain and run through cold water. Once the carrots and red bell peppers have softened add them to the bowl of cooked veggies. Using a pair of kitchen scissors take the drained, slightly cooled sweet potato noodles and cut through them several times to turn the long noodle strains into more malleable strands. 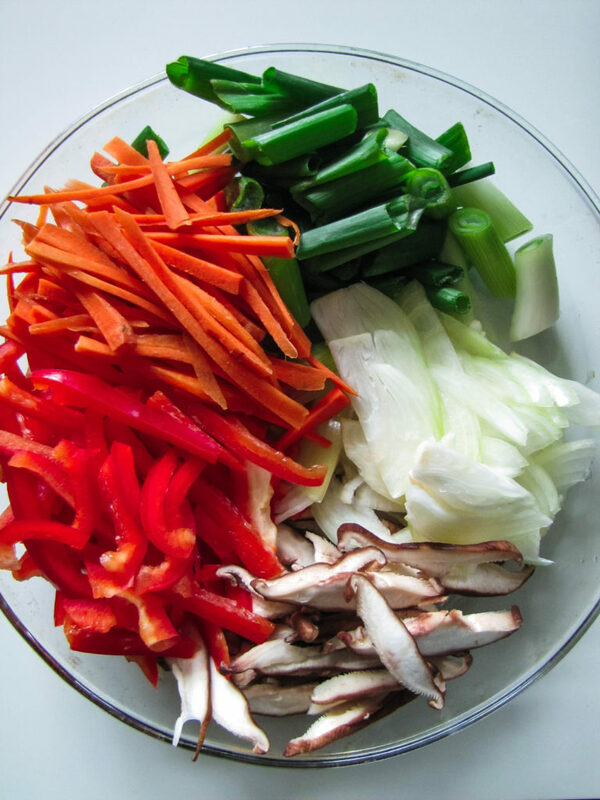 Once cut add the noodles to the bowl of veggies. Add in the coconut sugar and the remainder of the sesame oil and tamari, as well as a pinch of salt. Using your hands combine all the ingredients together. Enjoy hot or cold. Top with sesame seeds!